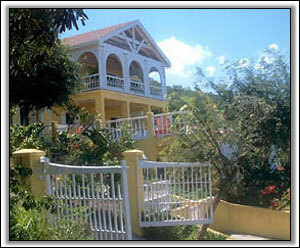 Allamanda, built on Round Hill, Nevis in 2002, is a traditional Nevisian house. 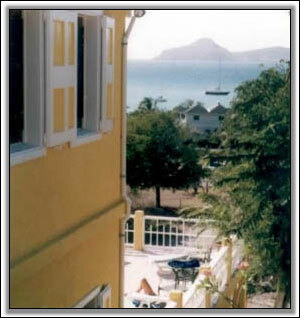 With stunning views of Oualie Bay, sister island Saint Kitts, and spectacular sunsets, there is no finer location to enjoy a rum punch. This large two story house is surrounded with the best nature has to offer, from Vervet monkeys, to palm trees, tamarind trees, and a beach just 200 yards away. 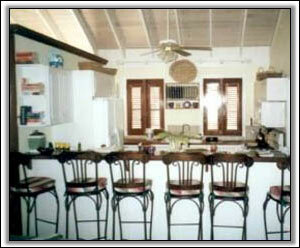 This Nevis paradise is designed with the discerning traveler in mind. The upper story of Allamanda consists of a large living room, dining area, breakfast bar, kitchen with all modern conveniences, cable TV and stereo, and ceiling fans. 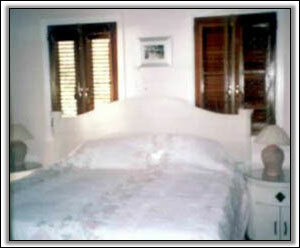 Leading off of the main living area, there are two double bedrooms complete with ensuite bathrooms and air conditioning. 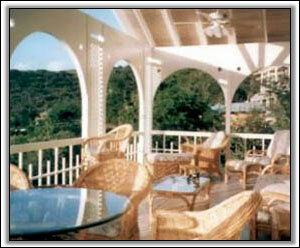 From the comfort of cane chairs and a dining table, you can enjoy your meals on the large verandah overlooking Nevis' Oualie Bay. 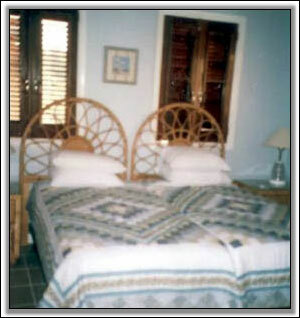 The lower story has a double bedroom with ensuite bathroom, and air conditioning with two extra beds (bunk beds). There is a laundry room complete with tumble dryer, and a storeroom with a BBQ grill. 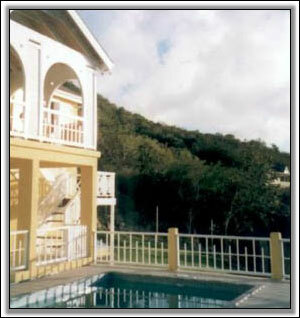 Allamanda also boasts a 24' x 12' pool on a raised terrace that looks out over the sea. The terrace is complete with deck chairs, tables, and a safety fence. 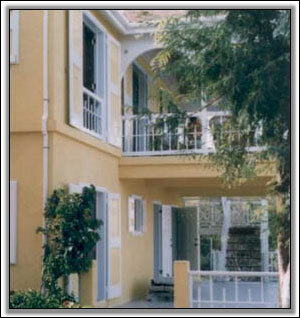 Allamanda is also convienetly located close to some of Nevis' finest dining, activities, and beaches.